As I proclaimed recently, wearing one skirt or dress a week is my summertime goal…and I’ve actually worn three in the past two weeks! and added two-toned tights along with my go-to motorcycle boots – easy! (which looked darker in real life). which is so great, I do believe it deserves an upcoming post all its own! ~ by admin_aef on May 12, 2013. I seriously love all of these looks. So creative! Popping by from Visible Monday. I love what you wore to the art opening…that is super cool!! All of these styles are fun…have a great week ahead! I agree with Pam–all looks are fab! I wear skirts and dresses almost exclusively; pants are very uncomfortable for me. I’ll wear leggings tho! You may find that skirts are easier to fit than pants! I like the fact that you love experimenting with fashion, a true fashionista! I love the second dress and I think the Desigual frock would look good on its own too topped with a denim jacket for summer. I love that tunic in the last photo. I’ve been looking for tunics to go over leggings, so this is interesting. I like it over the ruched skirt – how cool! Great looks! Love the moto boots of course, and the Desi dress. Thanks for sharing with Visible Monday! Love those boots. I am living in my old Frye boots right now, I am now inspired to model them. I found you from Patti’s place, nice to meet you! You are so right, that Desigual frock and Weston Wear ruched pencil skirt deserve a post all its own, AMAZING! Although I really love how you paired your summer boatneck dress with your moto boots, very funky. Fantastic looks —- the dress is amazing. Wonderful print. 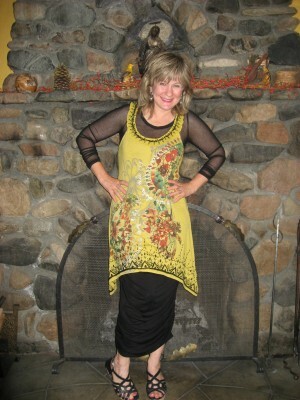 Love the looks, the tunic is a totally popper! I love Desigual’s aesthetic and that top looks terrific on you! In fact, all the looks work very well! You looked absolutely fantastic at your opening! Your creative and artistic persona was not only gracing the walls, but also exhibited by your apparent personal S.T.Y.L.E. … Bravo!!! I’m loving the “go-to motorcycle boots”…effortless chic. The patterned tights also caught my eye. Your art opening look is “artsy” so it fits. You look great in skirts/dresses! You look GREAT in all of your outfits but the last one is absolutely beautiful! !